This video was shot on May 2, 2018 at 6 a.m., by the Paradise Helicopters crew. 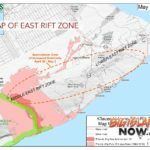 The complete collapse of the active vent on Kīlauea’s east rift zone on Monday, April 30, 2018, sent an amazing ash plume skyward, and blanketed a three-mile-long swath of the current eruption in red dust, said the Paradise Helicopters crew. They said: “61g looks like Mars! Yesterday, in very inclement weather, we managed some shots of the ash plume roiling away. Today, under stunningly beautiful skies, we were able to see inside the vent. Hundreds of feet deep, we saw no lava in the vent at all—just cinders and rubble. Additionally, a half-mile-long line of steamy fissures runs west from the vent. Will Pele stay underground, or will a surge of lava downrift start a new eruption? Time will tell. 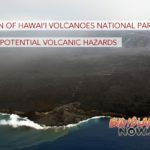 Hawai‘i County Civil Defense and the USGS Hawaiian Volcano Observatory advise residents of the Puna District to remain alert, review individual, family and business emergency plans, and watch for further information about the status of the volcano. Hawai‘i County Civil Defense messages may be found online.